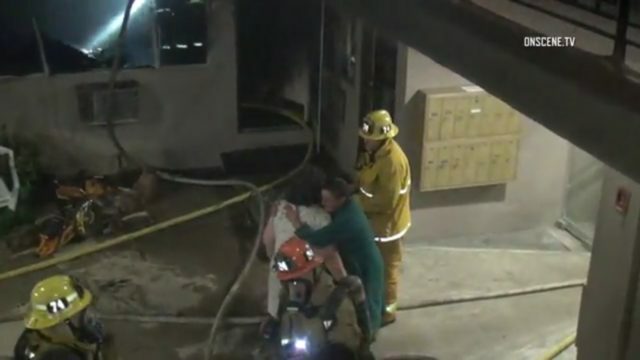 One man was killed and a woman was injured in a fire in a first-floor unit of a Tujunga apartment building, authorities said. The fire was reported at 10:55 p.m. at 7053 Greeley Street, Brian Humphrey of the Los Angeles Fire Department said. It took 34 firefighters 16 minutes to put out the flames confined to three rooms of the apartment in the 26-unit, almost 20,000-square-foot building constructed in 1963, Humphrey said. The dead man was found in the kitchen of the burned apartment, he said. A videographer at the scene said the woman was presumably the man’s wife. The cause is under investigation but witnesses said there was some type of explosion.